Join us for our 6th annual Winter Conference, Sunday March 3, 2019 at our NEW location at the Audubon Education Center in Bristol, RI. We are thrilled to welcome keynote speaker Jack Algiere of Stone Barns Center for Food & Agriculture. Jack Algiere was born and raised in southern Rhode Island, graduated from the University of Rhode Island. He’scultivated a wealth of experience working on farms from Rhode Island to Costa Rica, to Colorado to California, to Connecticut and now New York where he is currently the farm director at Stone Barns Center. More on Stone Barns Center here. Jack Algiere will encourage and inspire innovation and collaborative efforts between farmers, chefs and artisans. Considering the ecology, agriculture, gastronomy and the culture we live in. I will describe some of the work that we have accomplished and continue to aspire towards at Stone Barns as well as some examples of successful enterprises and relationships that have endured. Foliar application is an effective method to increase the overall health of crops; encouraging insect and disease resistance and producing higher yields. The mysteries of foliar spray are to be found in understanding what to apply and when. We will review materials and preparations of foliar sprays and explore specific crop situations to determine their appropriate foliar applications that lead toward maximum crop health. Bryan O’Hara:Has grown vegetables at Tobacco Road Farm in Lebanon, CT for 25 years. City Farm stewards, Rich Pederson and Alejandra Mayorga will go over their soil care practices step by step. This session will help participants replicate these practical methods on their own food growing spaces for the 2019 season. City farm is a 3/4 acre bio-intensive urban farm that keeps producing bountiful crops year in and year out and we believe it’s all starts with the soil. We will share the inspiring mission, values, & goals of Sanctuary Herbs and display the inner workings of our operation as it has unfolded in the past two years. We grow many herbs ourselves and contract with farmers to produce herbal tea blends and medicinal products. Saving locally-adapted seed is one of the foundational ways to preserve family, community, and regional food culture and food security. In this session we will cover the basics: selecting varieties for seed saving, understanding pollination, and isolation techniques, and judging seed ripeness. From setting up a smart system you can manage and maintain to understanding the right input ratios, all the way to turning, screening and using your compost. When is it done? When is it usable? We will discuss how you can determine when your compost is finished as well as analyze a sample of compost through the microscope to see what healthy compost brings to your soils. Take a deep dive into the methods of developing an active educational model for farmers, chefs and citizens at large. We will illustrate what it takes to teach and inspire success for emerging farmers, chefs and foodies as we connect to make change in the food system that is a win for all parties. Shannon and Jack will co-present our experience operating and leading an Stone Barns was founded organization focused on this intersection. The benefits are amazing. The challenges are real. What is worth growing yourself? What are the greatest pain points? What are the most amazing benefits? In this session we will explore the journey of Matunuck Oyster Bar to create and maintain an organic vegetable farm to supply the restaurant. Plants and soil exist together in nature as one connected system. Processes like photosynthesis and soil microbe metabolism keep the system functioning and nurture the symbiotic relationship between them. Let’s talk about how to best manage and optimize these processes in order to raise excellent crops. This workshop will help you understand how to read your soil test report from Logan Labs. We will discuss Total Exchange Capacity, Organic Matter, Mineral and Trace Element Requirements for growing vegetables based upon the Albrecht method of soil balancing. Laura Davis, operates Long Life Farm in Hopkinton, MA assists growers with their soil amendment needs. 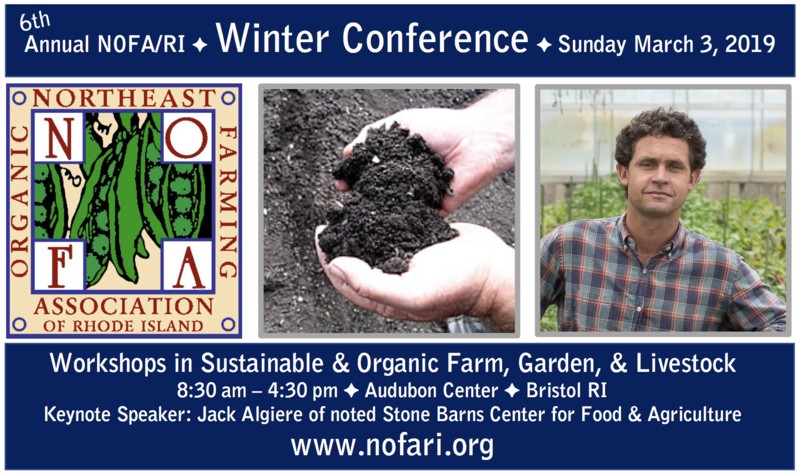 Jack Algiere: Farm Director and founder at Stone BarnsCenter for Food & Agriculture. Jack has been actively farming since the early 1990s. His lifetime of experience in organic, biodynamic and ecological systems brings a broad diversity of experience in greenhouses, orchards, fields and pastures. Jack was born and raised in southern Rhode Island on a family homestead. Shannon Algiere, Farm Liaison Stone Barns Center. While studying at the University of Rhode Island, Shannon was inspired to think about food sourcing and holistic nutrition. She’s taught at the Denison Pequotsepos Nature Center, volunteered for the Costa Rica National Park Service, managed a biodynamic greenhouse operation and helped develop a 60-member market farm in Connecticut. Bill Braun, Ivory Silo Farm. Bill is a vegetable grower and seed saver at the Ivory Silo Farm in Westport, MA. He and his partner Deanna Levanti grow on roughly 4 acres using sustainable practices and with great respect to biological diversity. Bill launched the Ivory Silo Seed Project, with a mission to foster a regionally adapted seed stock for growers. The farm is working to serve as a hub for seed processing and education, and partnering with farmers and gardeners to expand seed saving efforts. Bryan O’Hara, 2016 NOFA Organic Farmer of the Year. Bryan has been growing vegetables on his Connecticut farm, Tobacco Road for over 25 years. With an intensive focus on building the health of the soil, he employs no-till natural farming methods. Bryan also introduces indigenous microorganisms (IMOs) from the surrounding forest into his compost systems and foliar sprays to feed, protect, and invigorate their field soil and vegetable crops. Christina Dedora, Co-Founder of Sancutary Herbs and Owner Blue Skys Farm. Christina began her farming career working on a farm in France. What had originally begun as a way to extend her visa, has become a passion that would shape her life and impact others. She not only started her own farm but open opportunities for imigratant farmers with Sancutary Herbs. Christina began the start-up Sancutary Herbs to showcase the important contributions of farmers from around the world who make their homes in the U.S.
John Kenny: Owner Big Train Farm, North Scituate, RI. Big Train Farm is a small certified organic farm practicing intensive crop production with an emphasis on soil health and sustainable growing practices. John Kenny has over 15 years of experience as an organic farmer as well as an academic background in biology and chemistry. Nhia Lee, Lee Family Farms, an herb farmer and partner grower for Sancutary Herbs. who imigrated to the US as a refugee from Laos when she was a child. Nhia grows mint, lemongrass, and basil. For Lee, working with Sancutary Herb represents a chance to chart her own path to success —something she’s dreamed of doing since landing in the U.S. when she was just 11. Perry Raso: Potter’s pond is where Perry Raso’s vision for Matunuck Oyster Bar restaurant and Raw Bar was born with the concept to provide “simple food, fairly priced using farm fresh products. The Farm to Table mission statement comes full circle with fresh vegetables grown on Perry Raso’s own vegetable farm on Potter Pond in Matunuck, RI. Perry holds both a BS and a MS in Aquaculture & Fisheries Techonology from the University of Rhode Island. Rich Pederson. A former schoolteacher with a master’s degree in Environmental Education, Rich’s interests in food, environmental and social justice found a natural outlet when he joined Southside Community Land Trust. He specializes in growing rare fruits and vegetables, composting and teaching others how to grow mega amounts of produce in small areas. Rich is a founding member of the Little City Growers Co-op and the Southside Market Collaborative. He loves his work. Jayne Merner Senecal, Earth Care Farms, Owner, Golden Root Gardening, Horticulturalist, Owner. Jayne grew up on the organic Earth Care Farm in Charlestown, and now operates Golden Root Gardening, a garden design and installation businessthat specializes in native plantings and hasearned several awards including 1stplace in Sustainable Landscapes from Rhode Island Nursery and Landscape Association. Jayne teaches workshops on home composting, soil preparation and more all using organic methods.